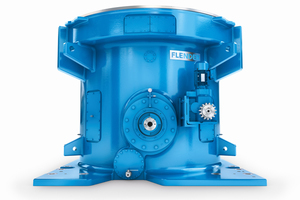 The history of the Flender brand vertical mill gear units starts in 1978. Since then they have become appreciably smaller, higher-performing and more efficient. 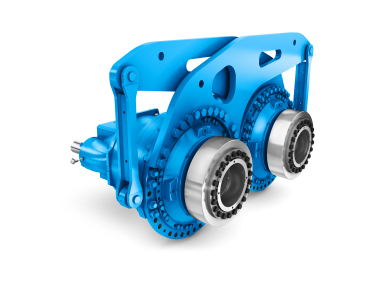 However, development does not stop there: extremely interesting figures show that the new, further-developed KM2P gear unit series enables mills to be driven even more productively. The reason? Standardised construction, higher power density, wider power range and increased safety. An exemplary production increase of the magnitude of 30 % is typical of the change of generation of vertical mill gear units at Flender GmbH – as well as many other features that should interest users. 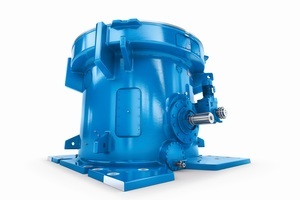 The comparison is with the previous KMPP gear unit series that, with typical average dimensions of 3750 mm in diameter and 2850 mm in height, has until now driven mills up to a maximum of 6000 kW. By contrast, its successor, the KM2P, with the same space requirement, transmits up to 7800 kW without the need for a special solution. 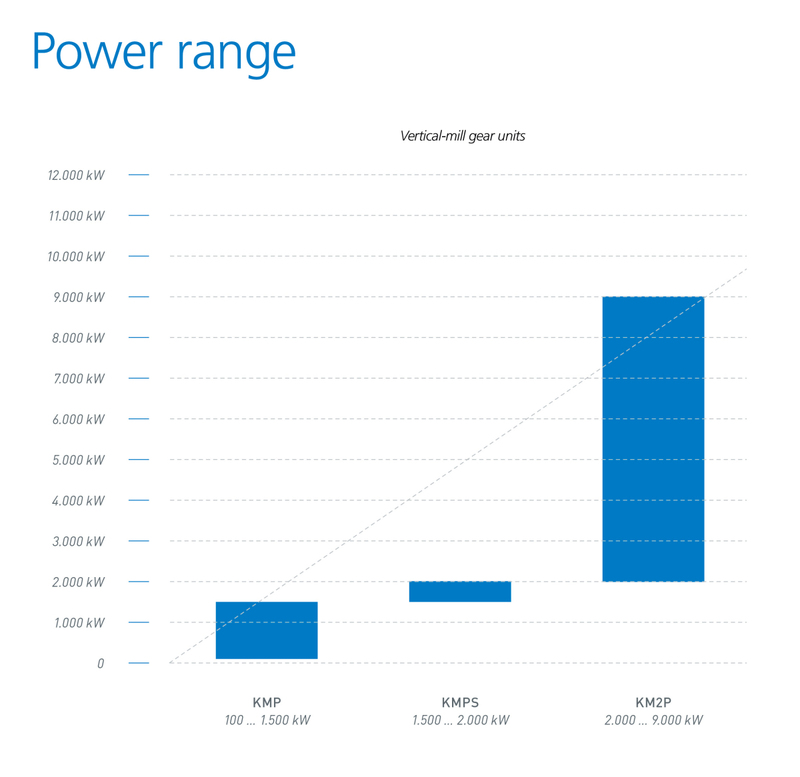 A considerable increase of power density, that is, the increase of power with the same or smaller dimensions, is one of the overriding aims pursued in the development process and has been achieved through a large number of technical optimisations. Essential for further developments of this magnitude is, for one thing, a comprehensive wealth of experience: over the last four decades the company has supplied over 7500 mill gear units worldwide – 1000 of them to the cement industry alone. For another thing, potential of this magnitude can be increased only if comprehensive field experience is combined with innovative strength: by placing both redundant multi-drives and electromechanical drives on the market Flender has always been an engine of innovation in past decades. 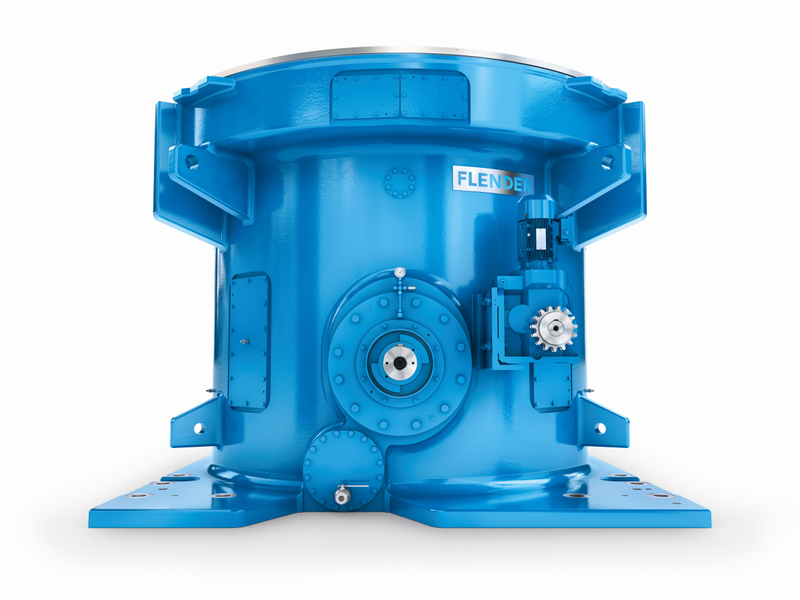 Close cooperation with mill manufacturers and cement producers ultimately makes Flender not only a gear unit specialist but also an application specialist. And it is precisely here that a further advantage of the new KM2P applies: unlike the previous gear unit series – and unlike comparable gear unit solutions on the market – the new KM2P has been fully standardised, so creating a completely designed range of gear units. Because what is almost common practice in the case of products in high quantities today has until now been impossible to find in the area of heavy-duty application-specific large gear units like vertical mill gear units. As users all over the world who build and operate mills know, higher standardisation means simplified engineering, shorter delivery times, high compatibility as well as more possibilities with regard to service and maintenance. This comprehensive standardisation strategy became possible, because decades of know-how in gear unit building jointly with specialists in mill construction was combined in a perfect way: leading mill builders were involved in the development process in order to use experience gained in the field in both areas to develop optimum vertical mill gear units and then offer coordinated mill and gear unit packages. 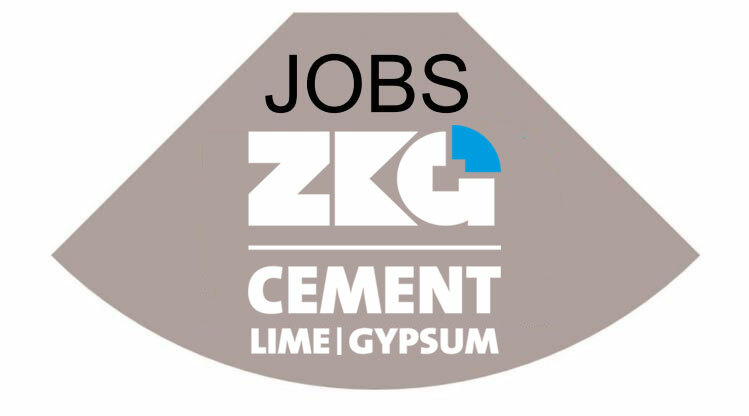 The motivation for the further development, which was launched on to the market for the first time about a year and a half ago, is the growing desire among cement producers for a markedly higher through-put, either by expansion of capacity or by increase of productivity. The gear units have meanwhile been delivered or are being manufactured for a number of projects in Asia, Africa and South America: cement production there will then profit from the many advantages of this innovative gear unit. What does the new KM2P do specifically that is different? 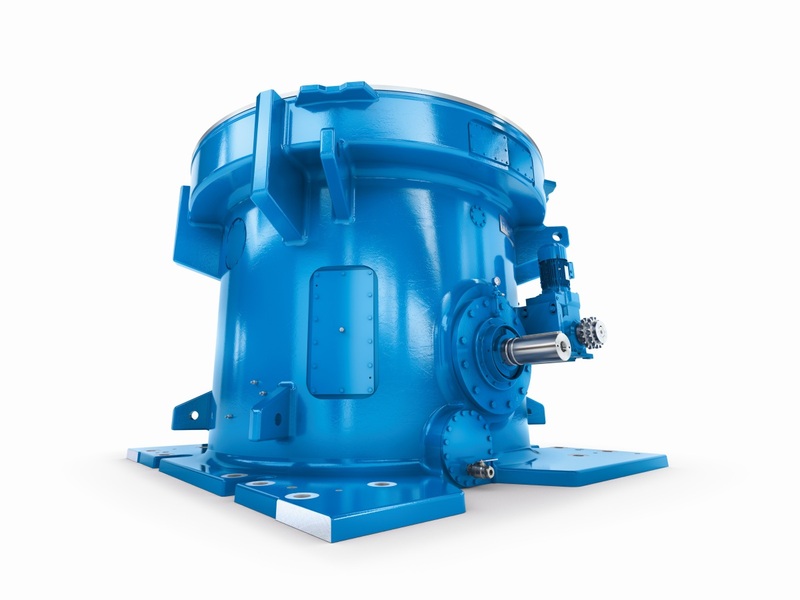 With a single mill gear unit series in three standard sizes Flender covers a markedly wider power range by means of a market-oriented power gradation: this KM2P modular system in the final expansion stage ranges from 2000 kW up to 9000 kW. That means that the new KM2P can serve more mills – and that with the same or an even smaller space requirement. Furthermore, the reliability level was raised: the decisive measures for this were, for one thing, optimisation of the transmission configuration of the gear stages so that the bevel gear stage now has a smaller, restricted transmission range. This results in harmonisation of the reactive forces, from which the bearings of the input shaft benefit, and an increase in gear accuracy at this stage. For another thing, all sliding bearings were markedly improved with regard to load-bearing capacity, oil supply and flexibility with regard to the level at which the forces set up by the grinding process are applied. The increase in reliability achieved in this way results in a markedly higher system availability – the most important thing for every system operator. This opens up advantages for mill manufacturers and operators at different levels, both for the extension of existing systems by new production lines (brownfield) or modernisation of already existing lines (updates) and for the planning of completely new systems (greenfield). The greenfield sector benefits from the markedly extended power range firstly because completely newly installed production systems can be designed for a much higher material throughput right from the start. Also, the smaller and lighter the gear units are, their transport to the mostly remote cement works and their handling on site can be carried out in a less problematic and more cost saving manner. So users profit from smaller dimensions in spite of higher power, as a result of which ultimately also mill construction can become easier and smaller. At the same time the standardisation coordinated with mill builders is a decisive guarantee of compatibility both with previous mill designs and the present generation of mills. The KM2P modular system is flexible and offers room for customer-specific adaptation: wide power ranges can be covered within a standard size. In this way for greenfield projects Flender sets standards of reliability, availability and performance and together with the mill delivers an innovative complete package incorporating the best available technology. 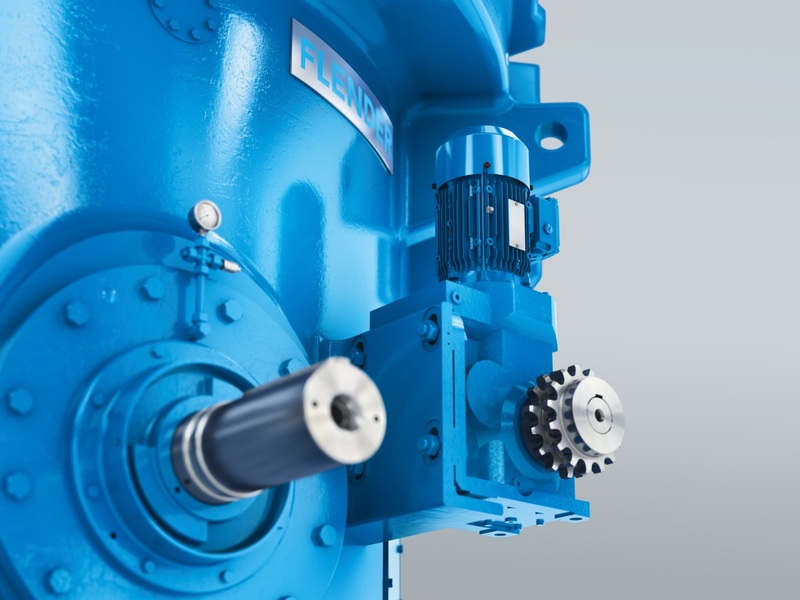 Extensive advantages also result in the update sector, where the production performance of existing mills can be considerably boosted by replacing an existing gear unit with a new KM2P. 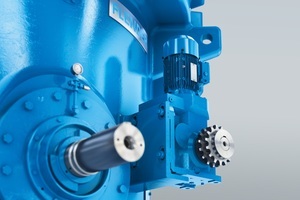 Because of mill-oriented standardisation, which takes into consideration compatibility with the previous, present and future generation of mills, a mill can frequently be equipped with a new drive without having to alter the structure around the gear unit, that is, the connection to the mill, the foundations or the oil-supply system. In this way, thanks to the markedly increased power density, even older mills can brought up to the latest level of productivity within the typical dimensions. Because of the easily adaptable housing concept the KM2P can, because of its very high flexibility, also regardless of standardisation, replace almost any mill gear unit worldwide, no matter where the mill gear unit so far used comes from. Put another way, the performance of all mill designs can be improved by integration of the modern, compact and high-performing KM2P built by Flender, because the extreme power density enables existing required fitting spaces to be better utilised. All the advantages of greenfield systems apply to the new production line: wider power range, outstanding availability and maximum reliability. Here many marginal requirements are already predetermined in the brown-ield sector, such as type of mill and gear unit in the already existing line. It is because of the extensive compatibility in combination with the massively increased power density that by choosing a KM2P the operator of such a production facility is given the opportunity to subject the already existing line to an update – and with the same gear unit. In this way increase in capacity can run parallel to increase in productivity and at the same time the spare-part concept can be considerably simplified. That saves money and time, because, if systems have to produce close to 10000 t of cement in 24-hour operation and so fill close to 250 40-t lorries, there is no room for failure. In the upshot, the new KM2Ps by Flender embody a new generation of vertical-mill gear units that are further developed in every respect and so enable system manufacturers and users worldwide to get more out of their systems. With them the aforementioned advantages can be utilised to also create economic advantages in the brownfield sector as well as in the greenfield and update sector. Standardisation and extensive compatibility enable fast planning of new systems for capacity expansion, and the existing mills can then be upgraded in update projects using the same mill gear units. 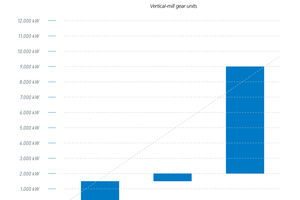 The new figures for KM2P vertical-mill gear units confirm that in milling one can always go that little bit further.